Paraguay, officially the Republic of Paraguay, is a landlocked country located in the center of South America. It lies on both banks of the Paraguay River, bordering Argentina to the south and southwest, Brazil to the east and northeast, and Bolivia to the northwest. The name "Paraguay" is derived from the Guaraní word pararaguay meaning "from a great river." The "great river" is the Paraná River, which produces the most hydroelectric power of any river in the world, but the nation lacks significant mineral or petroleum resources. Its economy is based primarily on agriculture, particularly soybeans, cotton, and cattle ranching. After decades of dictatorship and military rule, Paraguay has made important strides on the road to democracy; in April 2008, an opposition candidate won the presidential election, ending 61 years of conservative rule. A small, landlocked country located in the heart of South America, it is rich in natural, cultural and historical heritage, born of a mixture of traditional Spanish culture with the native Guaraní culture. Paraguay is divided by the Paraguay River into the eastern region—officially called Eastern Paraguay (Paraguay Oriental) and known as the Paraneña region—and the western region, officially Western Paraguay (Paraguay Occidental) and also known as the Chaco. The western region is home to less than five percent of the population, yet covers about 60 percent of the country. It is an arid flat plain formed from sediment washing off the eastern slopes of the Andes that stretches across northern Argentina, southeastern Bolivia, and western Paraguay. The soil has a high salt content and is unsuited to agriculture. In the rainy season, the rivers overflow and flood the land, creating swamps. The wildlife, including sixty known species of snakes, has adapted to the harsh conditions. The eastern region has a rainfall of 60 inches per year and is more fertile, with exotic flowers, subtropical forests, rolling hills, and low mountains similar to the foothills of the Andes. The highest point is only 2,762 feet (842 m) above sea level. Most of the country is less than 1,000 feet (300 m) above sea level. With an area of 157,048 square miles (406,752 sq. km), Paraguay is about the size of the U.S. state of California. The southeastern border is formed by the Paraná River, containing the Itaipu Dam shared with Brazil. It is currently the largest hydroelectric power plant in the world, generating nearly all of Paraguay's demand for electricity. Another large hydroelectric power plant on the Paraná River is Yacyretá, shared by Paraguay and Argentina. Paraguay is currently the world's largest exporter of hydroelectric power. The climate ranges from subtropical to temperate, with substantial rainfall in the eastern portions, though becoming semi-arid in the far west. During the rainy season, as much as 15 percent of the land is covered by marshes and swamps. About 500 species of hardwood trees grow in Paraguay, as well as eucalyptus, cedar, and yerba maté, the last a relative of the holly that is used to make tea. The Chaco has an abundance of wildlife. Mammals include jaguars, ocelots, peccaries, deer, giant anteaters, armadillos, tapirs, coatimundis, and capybaras. Reptiles include the poisonous coral snake and the anaconda. Birds range in size from miniature hummingbirds to the rhea, related to ostriches, as well as a number of water birds that live in the marshlands in the southwest. At least 238 fish species live in Paraguay's rivers. 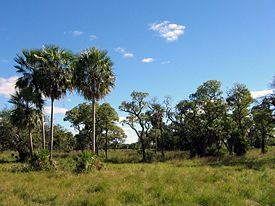 Paraguay had been home to native tribes, including the Guaraní, for thousands of years before Europeans first arrived in the area in the early sixteenth century. They fished, hunted, gathered wild fruit and vegetables, and grew corn, manioc, and other crops. While Paraguay was of little attraction initially because it did not offer gold and silver as did many of its neighbors, the Spanish passed through it on their way to Peru. The settlement of Asunción was founded on August 15, 1537, by the Spanish explorer Juan de Salazar. 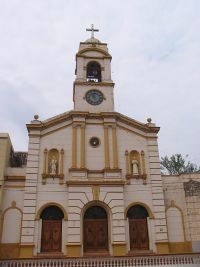 The city eventually became the center of a Spanish colonial province as well as a primary site of Jesuit missions and settlements in South America in the eighteenth century. Paraguay declared its independence after overthrowing the local Spanish authorities on May 14, 1811. Three successive dictators for life, José Gaspar Rodríguez de Francia (1813–1840), Carlos Antonio López (1841–1862), and Francisco Solano López (1862-1867) ruled Paraguay until 1870. 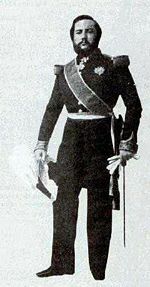 The third one declared war on Brazil in 1864; when he moved troops through Argentina without permission, Argentina and then Uruguay joined forces with Brazil and the alliance of three nations defeated Paraguay after five years of heavy fighting. The War of the Triple Alliance had a devastating, long-term effect on Paraguay. In addition to losing 55,000 square miles (142,450 sq km) of productive territory in the southeast and northeast, the government had to sell many of its assets to pay reparations. Nearly half the population, which lived in the more densely populated forfeited area was lost, leaving a rural population of mostly women and children. After a period of occupation by the victors, two groups emerged that later became the Colorado and Liberal Parties, which competed for power. The Colorados ruled until 1904, the Liberals for the next 32 years, but all the governments were authoritarian. Immigration was encouraged, and religious refugees from European nations arrived. In 1921 a law passed by the Paraguayan congress in effect allowed the Mennonites, largely German speaking, to create a state within the state of Boqueron. In the Chaco War, fought with Bolivia from 1932 to 1935, Bolivia was defeated and Paraguay re-established sovereignty over the Chaco region. Dissatisfaction with how the government had run the war led to a military takeover in the February Revolution of 1936. More years of instability followed, until civil war broke out in 1946. Alfredo Stroessner took over in 1954, and though he set up the trappings of a democracy, he ruled as a virtual dictator until 1989. Paraguay became progressively isolated from the world community. On February 3, 1989, Stroessner was overthrown in a military coup headed by Gen. Andres Rodriguez. Rodriguez, as the Colorado Party candidate, easily won the presidency in elections held that May, and the Colorado Party dominated the Congress. In 1991 municipal elections, however, opposition candidates won several major urban centers, including Asuncion. As president, Rodriguez instituted political, legal, and economic reforms and initiated a rapprochement with the international community. The constitution was amended in 1992 to prevent presidents from running for consecutive terms. The June 1992 constitution also established a democratic system of government and dramatically improved protection of fundamental rights. 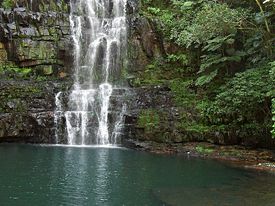 Salto Cristal, Yvykui National Park, Paraguay. Paraguay's government was fundamentally changed by the 1992 constitution, which reinforced a division of powers that existed mostly in writing in the previous two Constitutions. In May 1993, Colorado Party candidate Juan Carlos Wasmosy was elected as Paraguay's first civilian president in almost 40 years in what international observers deemed fair and free elections. The newly elected majority-opposition Congress quickly demonstrated its independence from the executive by rescinding legislation passed by the previous Colorado-dominated Congress. With support from the United States, the Organization of American States, and other countries in the region, the Paraguayan people rejected an April 1996 attempt by then-Army Chief Gen. Lino Oviedo to oust President Wasmosy, taking an important step to strengthen democracy. Paraguay is now a representative democratic republic, with a multi-party system and separation of powers in three branches. Executive power is exercised solely by the President, who is head of state and head of government. Legislative power is vested in the two chambers of the National Congress. The judiciary is vested on tribunals and Courts of Civil Law and a nine-member Supreme Court of Justice, all of them independent of the executive and the legislature. Paraguay's highly centralized government was fundamentally changed by the 1992 constitution, which provides for a division of powers. The president, popularly elected for a five-year term, appoints a cabinet. The bicameral Congress consists of an 80-member Chamber of Deputies and a 45-member Senate, elected concurrently with the president through a proportional representation system. Deputies are elected by department and senators are elected nationwide. The judiciary is independent of the executive and the legislature. Paraguay's highest judicial body is the Supreme Court. 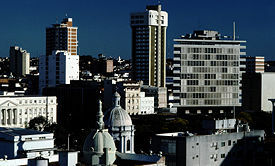 Paraguay consists of 17 departments and one capital district. A popularly elected governor heads each department. In recent years, Paraguay has made important progress toward greater fiscal transparency. The fairly comprehensive financial administration law (1999) has been complemented by recent legal reforms that eliminated most tax exemptions, revamped revenue administration procedures and introduced standardized transparency requirements for public procurement, all of which reduce the scope for corruption. The constitution designates the president as commander in chief of the armed forces. Military service is compulsory. Of the three services, the army has the majority of personnel, resources, and influence. With about 7,000 personnel, it is organized into three corps, with six infantry divisions and three cavalry divisions. The military has two primary functions: national defense (including internal order) and engaging in civic action programs as directed by the president. The navy consists of approximately 2,000 personnel and in addition to its fleet, has an aviation section, a prefecture (river police), and a contingent of marines (naval infantry). The air force, the smallest of the services, has approximately 1,200 personnel. Paraguay is a member of the United Nations and several of its specialized agencies. It also belongs to the Organization of American States, the Latin American Integration Association (ALADI), the Rio Group, and MERCOSUR (the Southern Cone Common Market). Paraguay is closely aligned with its MERCOSUR partners on many political, economic, and social issues. It is the only country in South American that recognizes Taiwan and not the People’s Republic of China. Where the borders of Argentina, Brazil, and Paraguay converge is a region that has become a center for money laundering, smuggling, arms and illegal narcotics trafficking, and fundraising for extremist organizations. Paraguay is a major illicit producer of cannabis, most or all of which is consumed in Brazil, Argentina, and Chile; and is a transshipment country for Andean cocaine headed for Brazil, other Southern Cone markets, and Europe. Anti-money-laundering laws and enforcement are weak. Paraguay has a predominantly agricultural economy, with a struggling commercial sector. There is a large subsistence sector, including sizable urban unemployment and underemployment, and a large underground re-export sector. The country has vast hydroelectric resources, including the world's largest hydroelectric-generation facility, built and operated jointly with Brazil (Itaipú Dam), but it lacks significant mineral or petroleum resources. The government welcomes foreign investment in principle, but widespread corruption is a deterrent. Paraguay's largest economic activity is based on agriculture, agribusiness, and cattle ranching. It is ranked as the world's third largest exporter of soybeans, and its beef exports are substantial for a country of its size. 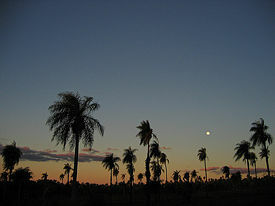 Palm trees swaying in the Paraguayan evening. It also exports cotton, grains, timber, and sugar; electricity; and to a decreasing degree, re-exports to Brazil and Argentina products made elsewhere. It is, therefore, vulnerable to the vagaries of weather and to the fortunes of the Argentine and Brazilian economies. According to International Monetary Fund (IMF) data, Paraguay's real GDP in 2005 of $8.06 billion (in 2000 dollars) represented an increase of 2.9 percent from 2004. The per capita GDP rose 1.02 percent to $1,288 in current U.S. dollar terms in 2005, but that was still below the peak of $1,793 in 1996. Given the importance of the informal sector, accurate economic measures are difficult to obtain. In 2005, Paraguay had a current account deficit of $190 million, with a large deficit in the trade of goods, but with a surplus in services, reflecting exports of electricity from Paraguay’s two large hydroelectric dams shared with Brazil and Argentina. In 2005, official foreign exchange reserves rose to $1.29 billion, an increase of 10.8 percent over 2004, and an increase of more than 100 percent from 2002 ($582.8 million). Inflation in 2005 rose to 9.9 percent, up from 2.8 percent in 2004, which was the lowest rate since 1970. Agricultural activities, most of which are for export, represent about 25.5 percent of GDP and employ just under half of the workforce. More than 200,000 families depend on subsistence farming activities and maintain marginal ties to the larger productive sector of the economy. In addition to a commercial sector with retail, banking and professional services, there is significant activity involving the import of goods from Asia and the United States for re-export to neighboring countries. The recorded activities of this sector have declined significantly in recent years, largely in response to tighter controls on imports and contraband on the part of Brazil. The underground economy, which is not included in the national accounts, may equal the formal economy in size, although greater enforcement efforts by the tax administration are having an impact on the informal sector. Despite difficulties arising from political instability, corruption, and slow structural reforms, Paraguay has been a member of the free trade bloc Mercosur, participating since 1991 as one of the founding members. Paraguay's economic potential has been historically constrained by its landlocked geography, but it does enjoy access to the Atlantic Ocean via the Paraná River. Because it is landlocked, Paraguay's economy is very dependent on Brazil and Argentina, its neighbors and major trade partners. Roughly 38 percent of the GDP derives from trade and exports to Brazil and Argentina. Through various treaties, Paraguay has been granted free ports in Argentina, Uruguay and Brazil through which it sends its exports. The most important of these free ports is on the Brazilian Atlantic coast at Paranaguá. The Friendship Bridge that now spans the Paraná River between Ciudad del Este and the Brazilian city of Foz do Iguaçu permits about forty thousand travelers to commute daily between both cities, and allows Paraguay land access to Paranaguá. A vibrant economy has developed in Ciudad del Este and Foz do Iguaçu, mostly based on international commerce and shopping trips by Brazilian buyers. Ethnically, culturally, and socially, Paraguay has one of the most homogeneous populations in Latin America. About 95 percent of the people are mestizos of mixed Spanish and Guaraní Indian descent. The original Spanish settlers mostly intermarried with the indigenous people and blended with their culture. One trace of the original Guaraní culture that endures is the Guaraní language, spoken by 94 percent of the population. The remainder of the people are white, unmixed Amerindian (one percent), and Asian (Chinese, Taiwanese, and Japanese Okinawan) (two percent). About 75 percent of all Paraguayans can speak Spanish. Guaraní and Spanish are both official languages. Small groups of ethnic Italians, Germans, Japanese, Koreans, Chinese, Arabs, Brazilians, and Argentines settled in Paraguay and to some extent they have retained their respective languages and culture, particularly the Brazilians. Paraguay's population is distributed unevenly throughout the country. About 56 percent of Paraguayans live in urban areas. 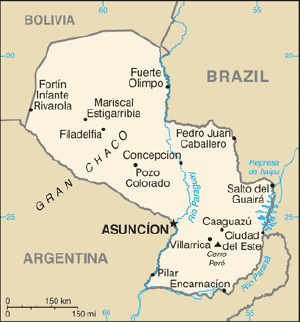 The vast majority of the people live in the eastern region near the capital and largest city, Asuncion, which accounts for ten percent of the country's population. The Chaco, a region of thorn forests, ponds, and marshes accounts for about 60 percent of the territory, and is home to less than two percent of the population. The country is predominantly Roman Catholic (90 percent), with evangelical Protestant, mainline Protestant, Mennonite, Mormon, and other Protestant minorities, Judaism (Orthodox, Conservative, and Reform), Islam, and the Bahá'í Faith represented as other religious groups. Paraguayans' cultural ancestry can be traced to the extensive intermarriage among the original male Spanish settlers and female Guaraní brides. Paraguayan culture therefore is a fusion of two cultures and traditions. More than 90 percent of Paraguayans are mestizos, and this makes Paraguay one of the most homogeneous countries in Latin America. A characteristic of this cultural fusion is the extensive bilingualism present to this day: more than 80 percent of Paraguayans speak both Spanish and the indigenous language, Guaraní. Jopara, a mixture of Guaraní and Spanish, is also widely spoken. This cultural fusion is expressed in arts such as embroidery and lace making. The music, which consists of lilting polkas, bouncy galopas, and languid guaranías, is played on the native harp. Paraguay's culinary heritage is also deeply influenced by this cultural fusion. Several popular dishes contain mandioca, a local staple crop similar to the yucca root found in the Southwestern United States and Mexico, and other indigenous ingredients. A popular dish is sopa paraguaya, similar to a thick corn bread. Another notable food is chipa, a bagel-like bread made from cornmeal, mandioca, and cheese. Many other dishes consist of different kinds of cheeses, onions, bell peppers, cottage cheese, yellow cornmeal, milk, seasonings, butter, eggs, and fresh corn kernels. The 1950s and 1960s saw the flowering of a new generation of Paraguayan novelists and poets such as José Ricardo Mazó, Roque Vallejos, and Nobel Prize nominee Augusto Roa Bastos. Several Paraguayan films have been made. There is a fairly high degree of mobility between classes, and even the poorest peasant displays a strong degree of personal pride. Social life revolves largely around an extended family of parents, children, and blood relations as well as godparents. Paraguayans' chief loyalty is to their family, and it, in turn, is their haven and support. Family interests determine to a large extent which political party they will join, whom they will marry, what sort of job they will get, whether they will win a lawsuit, and—in some cases—whether they would be wise to emigrate for a time. Inside the family, conservative values and gender roles predominate. In lower classes, godparents have a special relationship to the family, since they are usually chosen because of their favorable social position, in order to provide extra security for the children. Particular respect is owed them, in return for which the family can expect protection and patronage. In higher classes, however, godparents are usually family members or family friends; being chosen is more of an honor than a serious commitment. Paraguay is still a poor and unequal society. Various poverty estimates suggest that between one-third and one-half of the population is poor. In rural areas, 41.2 percent of the people lack a monthly income to cover basic necessities, whereas in urban centers this figure is 27.6 percent. The top 10 percent of the population holds 43.8 percent of the national income, while the lowest 10 percent has only 0.5 percent. The economic recession has worsened income inequality, notably in the rural areas. Land concentration in the Paraguayan countryside is one of the highest in the globe: 10 percent of the population controls 66 percent of the land, while 30 percent of the rural people are landless. This inequality has caused many tensions between the landless and elites. The World Bank has helped the Paraguayan government in tackling overall reduction of Paraguay's maternal and infant mortality. The Mother and Child Basic Health Insurance Project aimed at contributing to reducing mortality by increasing the use of selected life-saving services included in the country's Mother and Child Basic Health Insurance Program (MCBI) by women of child-bearing age, and children under age six in selected areas. To this end, the project is also targeted at improving the quality and efficiency of the health service network within certain areas, in addition to increasing the Ministry of Public Health and Social Welfare's (MSPBS) management capacity. ↑ International Constitutional Law, Article 140 About Languages Paraguay - Constitution. (see translator's note) Retrieved January 6, 2019. ↑ 2.0 2.1 2.2 2.3 2.4 International Monetary Fund, Paraguay World Economic Outlook Database, October 2018. Retrieved February 6, 2019. ↑ Gini Index World Bank. Retrieved February 6, 2019. ↑ Estanislao Gacitúa Marió, Annika Silva-Leander, and Miguel Carter, Paraguay: Social Development Issues for Poverty Alleviation. Social Analysis Paper No. 63 (2004) . Retrieved February 6, 2019. CIA World Factbook. Paraguay, People. Retrieved February 6, 2019. U.S. State Department. U.S. Relations With Paraguay Retrieved February 6, 2019. This page was last modified on 6 February 2019, at 20:24.